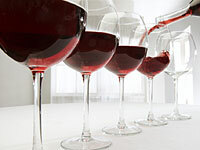 THURSDAY, January 12, 2012 (Health.com) — The University of Connecticut has notified 11 scientific journals that research on the potential health benefits of red wine led by one of its faculty members appears to contain falsified and fabricated data. Following a three-year investigation, a university review board has concluded that Dipak K. Das, Ph.D., the director of the Cardiovascular Research Center at the university's school of medicine, in Farmington, manipulated research data in at least 145 instances. The misconduct spanned seven years and 26 journal articles, according to a report issued by the board. Resveratrol: Miracle Supplement or Rip-Off? Researchers in labs around the world are studying resveratrol for its possible effects against cancer, obesity, diabetes, inflammation, and aging. The compound has been making headlines since initial research showed that it helped obese mice live longer, says James Smoliga, Ph.D., one of Baur's coauthors and an associate professor of physiology at High Point University, in High Point, N.C.
Much of the research to date has been promising, Smoliga says, but most studies—like those led by Das—involve only laboratory experiments and animal trials. Few clinical trials have been conducted in humans, although several long-term studies are now under way.